With its innovative crossover design, the AV Bridge MatrixMIX Multipurpose AV Switcher can be used in a host of applications including live production, automated presentation, and unified conferencing and collaboration. The AV Bridge MatrixMIX offers a multifunctional feature set to combine switching, advanced camera control, streaming and graphics mixing capabilities – all from a single appliance. This built-in versatility lets you enhance presentations or live events with graphics and interactive content for a superior user experience – and you can live stream it to a UCC application as well. Because it is easy to use, an IT staffer or volunteers at a house of worship can create a first-rate production without extensive training. 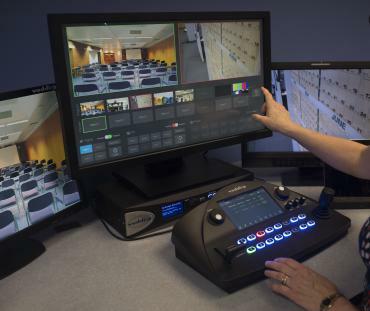 With the AV Bridge MatrixMIX and the TeleTouch MultiViewer, the user simply touches the screen for live video production to choose which camera scene to use and it goes live. 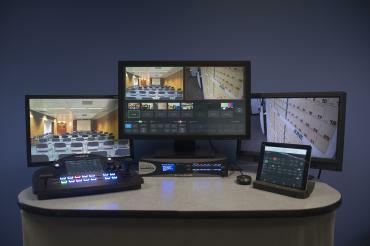 The AV Bridge MatrixMIX AV Switcher is an 8x2 video mixer that also provides multiviewer output. Its 11x7 audio mixer supports analog, HDMI, USB and IP audio channels. It offers embedded RTSP IP and USB 3.0 output streaming, plus two graphic keying layers per output channel. PCC MatrixMIX Live Production Controller Designed for use with the AV Bridge MatrixMIX Multipurpose AV Switcher, the PCC MatrixMIX Live Production Controller is equipped with precision controls for camera operation via the AV Bridge MatrixMIX. TeleTouch 27" USB Touch-Screen Multiviewer Touch screen LCD monitor with base. For easy, intuitive touch control of the AV Bridge MatrixMIX switcher.